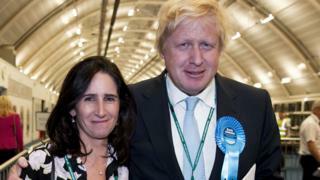 Former Foreign Secretary Boris Johnson and his wife Marina Wheeler have confirmed they have separated. In a joint statement, they said they are now in the process of divorcing, after the Sun newspaper broke the news of their split. The couple have been married for 25 years and said the decision was taken some months ago. Mr Johnson, long touted as a future Tory leader, quit the cabinet in July attacking Theresa May's Brexit plan. In a joint statement, he and Ms Wheeler said: "Several months ago, after 25 years of marriage, we decided it was in our best interests to separate. "We have subsequently agreed to divorce and that process is under way. "As friends we will continue to support our four children in the years ahead. "We will not be commenting further." Mr Johnson and Ms Wheeler, a barrister, married in 1993 and have four children together, Lara Lettice, Milo Arthur, Cassia Peaches and Theodore Apollo. He was previously married to Allegra Mostyn-Owen, a fellow student at Oxford. News of the split follows newspaper allegations about Mr Johnson having had another extra-marital affair. In 2004, the MP was sacked from a shadow ministerial role by then Conservative leader Michael Howard for allegedly lying over an affair with journalist Petronella Wyatt - something he had denied as an "inverted pyramid of piffle". He fronted the Vote Leave campaign during the 2016 EU referendum and joined Theresa May's first cabinet as foreign secretary but quit in July, shortly after his fellow cabinet Brexiteer David Davis resigned, over the prime minister's Chequers plan for the UK's future relationship with the EU. In 2016, following David Cameron's resignation, Mr Johnson dramatically ruled himself out of the race to be the next Conservative leader and prime minister, after his fellow Brexit campaigner Michael Gove's surprise announcement that he would run. But the former mayor of London and current MP for Uxbridge and South Ruislip is widely thought to continue to harbour leadership ambitions. Conservative MP and digital industries minister Margot James, who has criticised the former foreign secretary in the past, said: "It is infuriating how Boris Johnson is continuously in the news. "The prime minister has a really difficult job to do, with the Brexit secretary, to get the best possible deal for this country out of the EU negotiations. "I'm frankly fed up with talking about Boris Johnson".